Robert Edward Haeger, son of Robert Douglas Haeger and Arline Louise Boncosky Carlson, was born, November 30, 1939 in Elgin, Illinois. He departed this life, September 9, 2018, in his home at the age of seventy-eight years, nine months and ten days. On July 7, 1996 in Bullhead City, Arizona, aboard the USS Riverside, he was united in marriage to Carole Loechelt. Together they shared twenty-two years of marriage. He was preceded in death by his parents, aunts, and uncles. He is survived by his wife, Carole Haeger of Camdenton, Missouri; one son, Robert Haeger and wife Leigha of Billings, Montana; two daughters, Tamara Kelley and husband Jason of Crystal Lake, Illinois, Jacquelyn (Boosie) Haeger of Littleton, Colorado; two step daughters, Kimberly Loechelt of Carpentersville, Illinois, and Denise Heatley and husband Christopher of McHenry, Illinois; five grandchildren, Danielle Meitzler and husband Nick, Kaitlin Rodriguez and husband Nik, Jordan Haeger, Lauren Haeger, and Lane Haeger; three step grandchildren, Brienne Kapaldo and husband Jeffrey, Nolan Heatley and Brandon Heatley; two step great grandchildren, Colton and Caisen Kapaldo; brother-in-law Michael McCarron and wife Shelly; and a host of nieces, nephews, other relatives and many friends. Robert was born in Elgin, Illinois and grew up in Algonquin, Illinois where he graduated from Dundee High School. After high school, he attended Iowa Wesleyan; he then went to Chicago-Kent College of Law where he graduated with honors in 1966. He started his own law firm in Dundee, Illinois where he was a lawyer for twenty years. 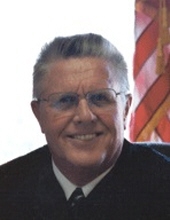 In 1985, he became a judge in Walsenburg, Colorado and retired in November, 2005. Robert made a profession of faith and was a member of Algonquin Congregational Church in Algonquin, IL. In his spare time, he loved fishing, making his own jigs and catching crappie. He was also an avid wood worker, making knives, and various furniture. Robert had his own ranch in Colorado where he raised Limousine Cattle with his son. He also owned the Lunker Lodge Fishing Resort in Texas for many years. Robert had his pilot license and his own plane that he would travel with. Robert enjoyed camping. He loved spending time gambling in his later years with Carole. He was a very loving husband, best friend, father, grandfather, great grandfather and a caring neighbor and friend. We celebrate his life and his accomplishments and will treasure the memories he created for his family and friends. Funeral services will be held at 12:00 p.m., Friday, September 14, 2018 in Allee-Holman-Howe Funeral Home, Camdenton, Missouri. Visitation will be from 10:00 am till the time of service in the funeral home. Memorial donations may be made to Lake Regional Hospice and left at the funeral home. To send flowers or a remembrance gift to the family of Robert E Haeger, please visit our Tribute Store. "Email Address" would like to share the life celebration of Robert E Haeger. Click on the "link" to go to share a favorite memory or leave a condolence message for the family.